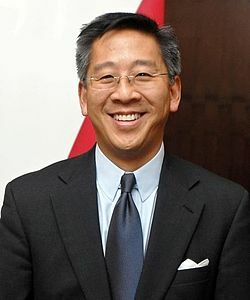 President Obama announced his intent to nominate Donald Lu as the next Ambassador to the Republic of Albania, under the charge of the U.S. Department of State. WASHINGTON, DC – Today, President Obama announced his intent to nominate Donald Lu as the next Ambassador to the Republic of Albania, under the charge of the U.S. Department of State. The appointment came as one of three individuals named to key Administration posts. The others included Robert A. Sherman as Ambassador to the Portuguese Republic; and Leslie E. Bains as a Member of the Board of Directors of the Securities Investor Protection Corporation. Donald Lu is a career member of the Senior U.S. Foreign Service. He is currently at the rank of Class of Minister-Counselor. Lu is currently serving as Deputy Chief of Mission at the U.S. Embassy in New Delhi, India. Previously, he served at the U.S. Embassy in Baku, Azerbaijan as the Charge d’Affaires from 2009 to 2010 and the Deputy Chief of Mission from 2007 to 2009. From 2003 to 2006, Lu was the Deputy Chief of Mission at the U.S. Embassy in Bishkek, Kyrgyzstan. He served as the Deputy Director for the Office of Central Asian and South Caucasus Affairs from 2001 to 2003 and Special Assistant to the Ambassador for the Newly Independent States from 2000 to 2001. Lu’s other overseas assignments include: Special Assistant to the Ambassador and then Political Officer at the U.S. Embassy in New Delhi, India, Consular Officer at the U.S. Embassy in Tbilisi, Georgia, and Political Officer at the U.S. Consulate in Peshawar, Pakistan. Lu was also a Peace Corps Volunteer in Sierra Leone from 1988 to 1990. He received a B.A. and M.A from Princeton University.